Traditionally, human facial expressions have been studied using either 2D static images or 2D video sequences. The 2D-based analysis is difficult to handle large pose variations and subtle facial behavior. This exploratory research targets the facial expression analysis and recognition in a 3D space. The analysis of 3D facial expressions will facilitate the examination of the fine structural changes inherent in the spontaneous expressions. The project aims to achieve a high rate of accuracy in identifying a wide range of facial expressions, with the ultimate goal of increasing the general understanding of facial behavior and 3D structure of facial expressions on a detailed level. The database presently contains 100 subjects (56% female, 44% male), ranging age from 18 years to 70 years old, with a variety of ethnic/racial ancestries, including White, Black, East-Asian, Middle-east Asian, Indian, and Hispanic Latino. Participants in face scans include undergraduates, graduates and faculty from our institute’s departments of Psychology, Arts, and Engineering (Computer Science, Electrical Engineering, System Science, and Mechanical Engineering). The majority of participants were undergraduates from the Psychology Department (collaborator: Dr. Peter Gerhardstein). Each subject performed seven expressions in front of the 3D face scanner. With the exception of the neutral expression, each of the six prototypic expressions (happiness, disgust, fear, angry, surprise and sadness) includes four levels of intensity. Therefore, there are 25 instant 3D expression models for each subject, resulting in a total of 2,500 3D facial expression models in the database. Associated with each expression shape model, is a corresponding facial texture image captured at two views (about +45° and -45°). As a result, the database consists of 2,500 two-view’s texture images and 2,500 geometric shape models. We investigated the usefulness of 3D facial geometric shapes to represent and recognize facial expressions using 3D facial expression range data. We developed a novel approach to extract primitive 3D facial expression features, and then apply the feature distribution to classify the prototypic facial expressions. Facial surfaces are classified by the primitive surface features based on the surface curvatures. The distribution of these features are used as the descriptors of the facial surface, which characterize the facial expression. We conducted the person-independent study to recognize the facial expression contained in our BU-3DFE Database, the result shows about 83% correct recognition rate in classifying six universal expressions using LDA approach. With the agreement of the technology transfer office of the SUNY at Binghamton, the database is available for use by external parties. Due to agreements signed by the volunteer models, a written agreement must first be signed by the recipient and the research administration office director of your institution before the data can be provided. Furthermore, the data will be provided to parties who are pursuing research for non-profit use. To make a request for the data, please contact Dr. Lijun Yin at lijun@cs.binghamton.edu. For any profit/commercial use of such data, please also contact both Dr. Lijun Yin and Mr. Scott Hancock in the Office of Technology Licensing and Innovation Partnerships at shancock@binghamton.edu. Note: (1) Students are not eligible to be a recipient. If you are a student, please have your supervisor to make a request. (2) Once the agreement form is signed, we will give access to download the data. To analyze the facial behavior from a static 3D space to a dynamic 3D space, we extended the BU-3DFE to the BU-4DFE. Here we present a newly created high-resolution 3D dynamic facial expression database, which is made available to the scientific research community. The 3D facial expressions are captured at a video rate (25 frames per second). For each subject, there are six model sequences showing six prototypic facial expressions (anger, disgust, happiness, fear, sadness, and surprise), respectively. Each expression sequence contains about 100 frames. The database contains 606 3D facial expression sequences captured from 101 subjects, with a total of approximately 60,600 frame models. Each 3D model of a 3D video sequence has the resolution of approximately 35,000 vertices. The texture video has a resolution of about 1040×1329 pixels per frame. The resulting database consists of 58 female and 43 male subjects, with a variety of ethnic/racial ancestries, including Asian, Black, Hispanic/Latino, and White. (1) Students are not eligible to be a recipient. If you are a student, please have your supervisor to make a request. (2) Once a license agreement is signed, we will give access to download the data. Research Team: Xiaozhou Wei, Yi Sun, Jun Wang, Matthew Rosato, Myung Jin Ko, Wanqi Tang, Peter Longo, Xiaochen Chen, Terry Hung, Michael Reale, Tony Worm, and Xing Zhang. Collaborator: Dr. Peter Gerhardstein of Psychology, SUNY Binghamton and his team (Ms. Gina Shroff). Because posed and un-posed (aka “spontaneous”) 3D facial expressions differ along several dimensions including complexity and timing, well-annotated 3D video of un-posed facial behavior is needed. We present a newly developed 3D video database of spontaneous facial expressions in a diverse group of young adults. Well-validated emotion inductions were used to elicit expressions of emotion and paralinguistic communication. Frame-level ground-truth for facial actions was obtained using the Facial Action Coding System. 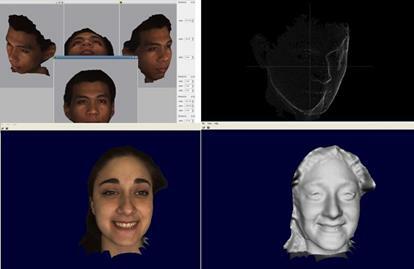 Facial features were tracked in both 2D and 3D domains using both person-specific and generic approaches. The work promotes the exploration of 3D spatiotemporal features in subtle facial expression, better understanding of the relation between pose and motion dynamics in facial action units, and deeper understanding of naturally occurring facial action. The database includes forty-one participants (23 women, 18 men). They were 18 – 29 years of age; 11 were Asian, 6 were African-American, 4 were Hispanic, and 20 were Euro-American. An emotion elicitation protocol was designed to elicit emotions of participants effectively. Eight tasks were covered with an interview process and a series of activities to elicit eight emotions. The database is structured by participants. Each participant is associated with 8 tasks. For each task, there are both 3D and 2D videos. As well, the Metadata include manually annotated action units (FACS AU), automatically tracked head pose, and 2D/3D facial landmarks. The database is in the size of about 2.6TB (without compression). With the agreement of the licensing office of the Binghamton University and Pittsburgh University, the database is available for use by external parties. Due to agreements signed by the volunteer models, a written agreement must first be signed by the recipient and the research administration office director of your institution before the data can be provided. Furthermore, the data will be provided to parties who are pursuing research for non-profit use. To make a request for the data, please contact Dr. Lijun Yin at lijun@cs.binghamton.edu. For any profit/commercial use of such data, please also contact both Dr. Lijun Yin and Mr. Scott Hancock in the Office of Technology Licensing and Innovation Partnerships at shancock@binghamton.edu. · Xing Zhang, Lijun Yin, Jeff Cohn, Shaun Canavan, Michael Reale, Andy Horowitz, and Peng Liu, “A high resolution spontaneous 3D dynamic facial expression database”, The 10th IEEE International Conference on Automatic Face and Gesture Recognition (FG13), April, 2013. · X. Zhang, L. Yin, J. Cohn, S. Canavan, M. Reale, A. Horowitz, and P. Liu, “A high resolution spontaneous 3D dynamic facial expression database”, The 10th IEEE International Conference on Automatic Face and Gesture Recognition (FG13), April, 2013. · M. Reale, X. Zhang, L. Yin, "Nebula Feature: A Space-Time Feature for Posed and Spontaneous 4D Facial Behavior Analysis", The10th IEEE International Conference on Automatic Face and Gesture Recognition (FG13), April, 2013. · S. Canavan, X. Zhang, and L. Yin, “Fitting and tracking 3D/4D facial data using a temporal deformable shape model”, IEEE International Conference on Multimedia and Expo. (ICME13), 2013. · P. Liu, M. Reale, and L. Yin, “Saliency-guided 3D head pose estimation on 3D expression models”, the 15th ACM International Conference on Multimodal Interaction (ICMI), 2013. · S. Canavan, Y. Sun, L. Yin, "A Dynamic Curvature Based Approach For Facial Activity Analysis in 3D Space", IEEE CVPR Workshop on Socially Intelligent Surveillance and Monitoring (SISM) at CVPR in June 2012. The “BP4D+”, extended from the BP4D database, is a Multimodal Spontaneous Emotion Corpus (MMSE), which contains multimodal datasets including synchronized 3D, 2D, thermal, physiological data sequences (e.g., heart rate, blood pressure, skin conductance (EDA), and respiration rate), and meta-data (facial features and FACS codes). There are 140 subjects, including 58 males and 82 females, with ages ranging from 18 to 66 years old. Ethnic/Racial Ancestries include Black, White, Asian (including East-Asian and Middle-East-Asian), Hispanic/Latino, and others (e.g., Native American). With 140 subjects and 10 tasks (emotions) for each subject included in the database, there are over 10TB high quality data generated for the research community. · Zheng Zhang, Jeff Girard, Yue Wu, Xing Zhang, Peng Liu, Umur Ciftci, Shaun Canavan, Michael Reale, Andy Horowitz, Huiyuan Yang, Jeff Cohn, Qiang Ji, and Lijun Yin, Multimodal Spontaneous Emotion Corpus for Human Behavior Analysis, IEEE International Conference on Computer Vision and Pattern Recognition (CVPR) 2016. · Shaun Canavan, Peng Liu, Xing Zhang, and Lijun Yin, Landmark Localization on 3D/4D Range Data Using a Shape Index-Based Statistical Shape Model with Global and Local Constraints, Computer Vision and Image Understanding (Special issue on Shape Representations Meet Visual Recognition), Vol. 139, Oct. 2015, p136-148, Elsevier. · Sergey Tulyakov, Xavier Alameda-Pineda, Elisa Ricci, Lijun Yin, Jeff Cohn, Nicu Sebe, Self-Adaptive Matrix Completion for Heart Rate Estimation from Face Videos under Realistic Conditions, IEEE International Conference on Computer Vision and Pattern Recognition (CVPR) 2016. This material is based upon work supported in part by the National Science Foundation under grants IIS-0541044, IIS-0414029, IIS-1051103, CNS-1205664, and CNS-1629898. Any opinions, findings, and conclusions or recommendations expressed in this material are those of the author and do not necessarily reflect the views of the National Science Foundation. We would also like to thank the support from the NYSTAR’s James D. Watson Investigator Program and SUNY IITG. Copyright @ GAIC lab, SUNY at Binghamton 2017.